The EUR/USD and other euro crosses remains pressured by growing signs of a slowdown in the Eurozone economy. While it did look from time to time last year that the EUR/USD was going to take off from here, a rally never really materialised, in part because the ECB refused to succumb to pressure and tighten its belt like the Fed. Despite the ECB suggesting otherwise, an interest rate increase in Q3 looks increasingly unlikely now given the recent fundamental developments — or lack thereof — with the Brexit situation still unresolved and the Eurozone economy ailing. Thanks to consistently weak data from Germany, this morning we found out the economy was at a standstill in the fourth quarter of last year. Zero growth means the economy has narrowly avoided a technical recession of two consecutive quarters of falling output, after its GDP had contracted 0.2% in the third quarter. Once again, though, the data disappointed forecasts for a meagre 0.1% growth in Q4. Weak external demand for German cars and other manufactured goods, from places such as China, has held back growth. With the Eurozone's largest economy struggling, GDP for the single currency bloc as a whole was never going to beat. Indeed, as expected, Eurozone GDP ‘expanded' by 0.2% quarter-on-quarter in Q4, meaning that output grew by a meagre 1.2% on a year-over-year basis, down from 1.3% recorded in 2017. Looking ahead, we have potentially market-moving data from the US to look forward to in the afternoon: Retail Sales and Producer Price Index (PPI) measure of inflation. Headline retail sales are expected to have risen by 0.1% m/m in January with core sales expected to have remained flat on the month. PPI is seen rising 0.1% on the headline front and 0.2% on the core front. We will have more US data on Friday, including Empire State Manufacturing Index, Industrial Production and Consumer Sentiment. From the Eurozone, the next set of important data is released next Thursday: the latest PMI numbers from the bloc's manufacturing and services sectors. 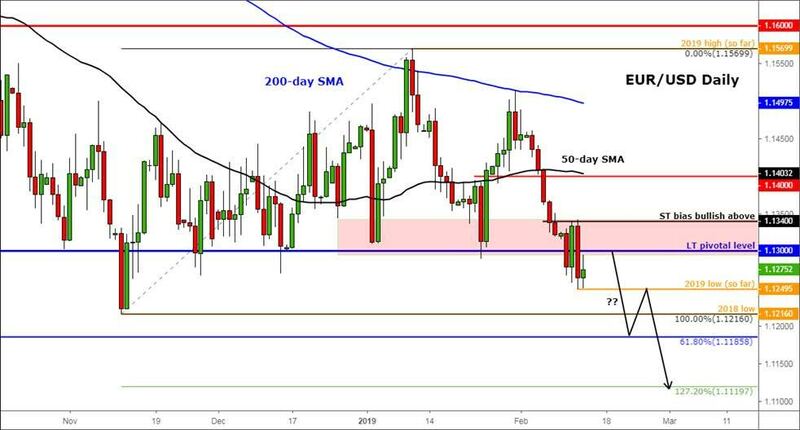 With the dollar remaining supported across the board, the EUR/USD could break decisively lower after spending the best part of the last 6 months or so trying to form a base around long-term support circa 1.1300. If support was strong here, surely we should have seen a rally by now. The lack of a rally suggests the pressure is growing for a potential breakdown, with lots of liquidity resting below the November low of 1.1215 which could potentially be tripped in the coming days. That being said, the short term technical bias would flip back to the bullish side within the existing longer term range-bound configuration, should price break above this week's high of 1.1340. But for the bulls to re-emerge in a meaningful way, we do need to see price now make a distinct higher high.